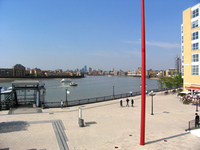 The meeting point of West Ferry Circus and the Thames on a hot summer day. There are few users because there is so little to use. 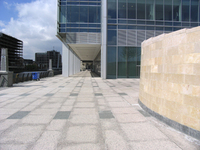 A south-facing, but vacant, 'plaza' by West India Dock. 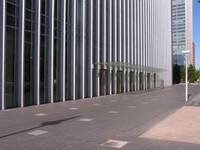 It has no planting, no seating and no cafes, no people. This is architecture - but not urban landscape design. 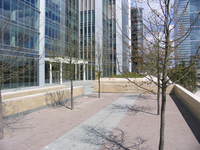 An east-facing plaza near West India Dock, designed to vacant. You can see why Canary Wharf is sometimes described as Gotham City.